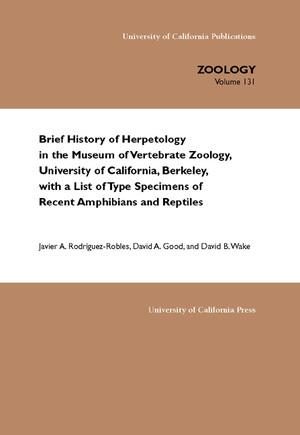 The Museum of Vertebrate Zoology (MVZ), located on the campus of the University of California, Berkeley, is a leading center of herpetological research in the United States. 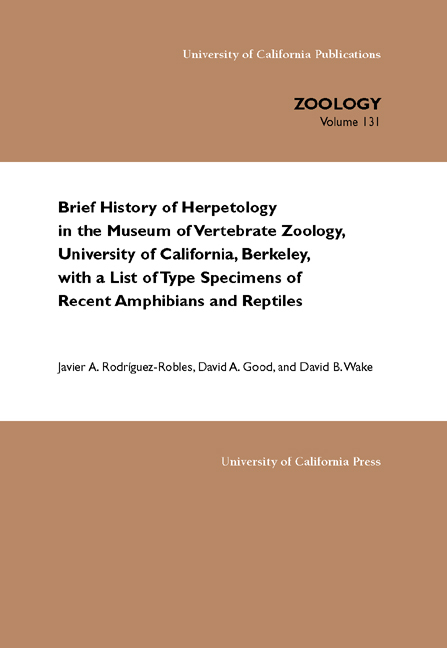 This monograph offers a brief account of the principal figures associated with the collection and of the most important events in the history of herpetology in the MVZ during its first 93 years, and lists all type specimens of recent amphibians and nonavian reptiles in the collection. Although the MVZ has existed since 1908, until 1945 there was no formal curator for the collection of amphibians and nonavian reptiles. Since that time Robert C. Stebbins, David B. Wake, Harry W. Greene, Javier A. Rodríguez-Robles (in an interim capacity), and Craig Moritz have served in that position. The herpetological collection of the MVZ was begun on March 13, 1909, with a collection of approximately 430 specimens from southern California and as of December 31, 2001, contained 232,254 specimens. Taxonomically, the collection is strongest in salamanders, accounting for 99,176 specimens, followed by "lizards" (squamate reptiles other than snakes and amphisbaenians, 63,439), frogs (40,563), snakes (24,937), turtles (2,643), caecilians (979), amphisbaenians (451), crocodilians (63), and tuataras (3). Whereas the collection's emphasis historically has been on the western United States and on California in particular, representatives of taxa from many other parts of the world are present. The 1,765 type specimens in the MVZ comprise 120 holotypes, three neotypes, three syntypes, and 1,639 paratopotypes and paratypes; 83 of the holotypes were originally described as full species. Of the 196 amphibian and nonavian reptilian taxa represented by type material, most were collected in México (63) and California (USA, 54). The Appendix of the monograph presents a list of curators, graduate and undergraduate students, postdoctoral fellows, research associates, research assistants, curatorial associates, curatorial assistants, and visiting faculty who have conducted research on the biology of amphibians and reptiles while in residence in the Museum of Vertebrate Zoology as of December 31, 2001. 1971-1998. He is also a Professor in the Department of Integrative Biology at the University of California, Berkeley.